A series of second-half defensive errors condemned the Hawks to a 5-2 defeat against Sutton United in their friendly at Westleigh Park. The two sides went into the break on level terms, 1-1, but Sutton capitalised on the Hawks errors to run out easy winners. Playing conditions were atrocious throughout and both teams were forced to splash their way through the contest. Sutton started on the front foot and created the best of the early chances. In the opening five minutes Craig Eastmond sent a header straight at Hawks goalkeeper Ryan Young. This was quickly followed by a 20-yard Nicky Bailey drive that flashed narrowly past the upright. It was the Hawks, however, who took a 28th-minute lead with a superbly worked goal. Ryan Woodford initiated the move with an excellent through-ball to Theo Lewis. The latter transferred the ball to the overlapping Rory Williams and his pin-point cross was turned in at the far post by Jason Prior. Sutton levelled five minutes before the break when Ross Lafayette’s shot from outside the area took a deflection and skidded past Young and into the net. Both teams could claim to have had blatant penalties turned down in the opening 45 minutes. After the break Sutton’s greater physical strength showed with the Hawks struggling to match it. Unfortunately two slips by defender Lee Molyneaux let Sutton in twice for two goals in 12 minutes. On 58 minutes he lost possession outside the area and as a result Young was forced to bring Tommy Wright down inside the box. Wright made no mistake with his spot-kick sending Young the wrong way. Molyneaux then lost his footing inside the area which allowed Sutton to cross the ball into the danger area. Though Young kept out the original header Nicky Bailey drilled in the rebound. 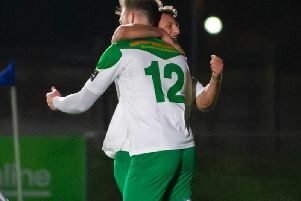 On 78 minutes eagle-eyed referee’s assistant Jacob Wright signalled that James Hayter’s hooked shot had crossed the line before it was cleared to see the Hawks reduce the deficit. Sutton though stepped up the pressure and added two further goals in the last five minutes. Young lost possession of a cross under pressure and Craig Dundas steered home the loose ball. Finally some clinical passing created a chance for Josh Taylor to fire home.